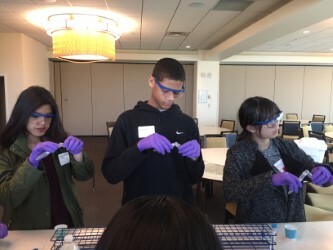 Twenty-five local middle and high school students from the Yale Pathways to Science program recently spent the day at Yale’s West Campus to learn about “omics” science and the cutting-edge research driving future discoveries in personalized medicine. Kicking-off the second annual Pathways to Genomics and Proteomics Day, Sarah Slavoff of the Chemical Biology Institute introduced students to the human genome before Yale graduate students and post-docs from Cell Biology, Chemistry, Genetics, Molecular, Cellular and Developmental Biology, and Neuroscience led students through a variety of hands-on activities and demonstrations. Students had the opportunity to make green fluorescent protein stickers, tour the Yale Center for Genome Analysis, discuss ‘bad science’ in movies, learn about mass spectrometry, and create their own DNA necklaces. “I really enjoyed Sarah Slavoff’s presentation as an introduction to understanding the human genome and then the modules that were very hands-on to aid our learning,” remarked one student about the day’s activities. Alongside graduate students and post-docs affiliated with his training program, this year’s Pathways to Genomics and Proteomics Day is the second to be supported by principal investigator Ronald Breaker, Henry Ford II Professor of Molecular, Cellular, and Developmental Biology and Professor of Molecular Biophysics and Biochemistry. Yale’s coordinated STEM outreach initiative, Pathways to Science has lowered the barriers for Yale faculty and students to engage in outreach. Last year, more than 600 Yale faculty, staff, post-docs, and graduate and undergraduate students were involved in STEM outreach programming. As a result of Pathways unified infrastructure, Yale community members can more easily plug into pre-existing programs or create new programs without starting from scratch. “Pathways to Science is a big win-win for everyone at Yale and in our community. We have a duty to engage local students in our sciences, and this program provides us with a ready-made way to do so,” said Jon Atherton, communications officer at West Campus. Pathways to Science staff provide support in drafting the Broader Impacts component of grant proposals. Currently, 1077 students in grades 6 through 12 from the New Haven, West Haven, and Amity public school districts are members of the Pathways to Science target group, along with more than 300 students who are now enrolled in college. Pathways invites these students to attend more than 85 different events and programs at Yale throughout the year. The program has developed a set of data-driven metrics to develop and market new programming more strategically and is able to evaluate the impact of programming longitudinally, tracking student participation through college completion. For more information about Pathways to Science, contact maria.parente@yale.edu or visit http://onhsa.yale.edu/science-outreach-home.